On September 9, 2015, the U.S. Department of State (DOS) and U.S. Citizenship and Immigration Service (USCIS) announced an important change to the visa processing system in the United States. In order to understand the changes, we should first review the basics of our immigrant visa system and then discuss the changes announced this week. The Immigration & Nationality Act (INA) sets limits on the number of immigrant visas (lawful permanent residence/green cards) that can be issued each year. The demand for immigrant visa numbers far exceeds the annual supply of visa numbers. Thus, for many years there has been a backlog of visas. Beneficiaries of approved Immigrant Visa Petitions must wait many years, in some cases, many decades before their visa number becomes available and they are eligible to receive lawful permanent residence in the United States. The number of available visas varies according to the visa preference category under which the Beneficiary falls. Under the current scheme, the visa numbers are divided into two broad categories: 1) Family Based and 2) Employment Based. These two categories are further subdivided into multiple Family Based and Employment Based subcategories. When a U.S. Employer files a visa petition (I-140) on behalf of a foreign employee or U.S. citizen or lawful permanent resident files a visa petition (I-130) on behalf of a family member, the visa petition is assigned a “Priority Date.” This date determines when the visa number becomes available for the Beneficiary of the visa petition. Once a Beneficiary’s Priority Date is current, he or she can submit his or her application for an immigrant visa and process at a U.S. Consulate abroad, or if in the United States and maintaining lawful nonimmigrant status (or the beneficiary of a visa petition filed on his or her behalf prior to April 30, 2001), can apply for lawful permanent residence through a process called Adjustment of Status. Importantly, a Beneficiary’s spouse and unmarried children under age 21 may also be eligible to receive visas as Derivatives of the primary Beneficiary. 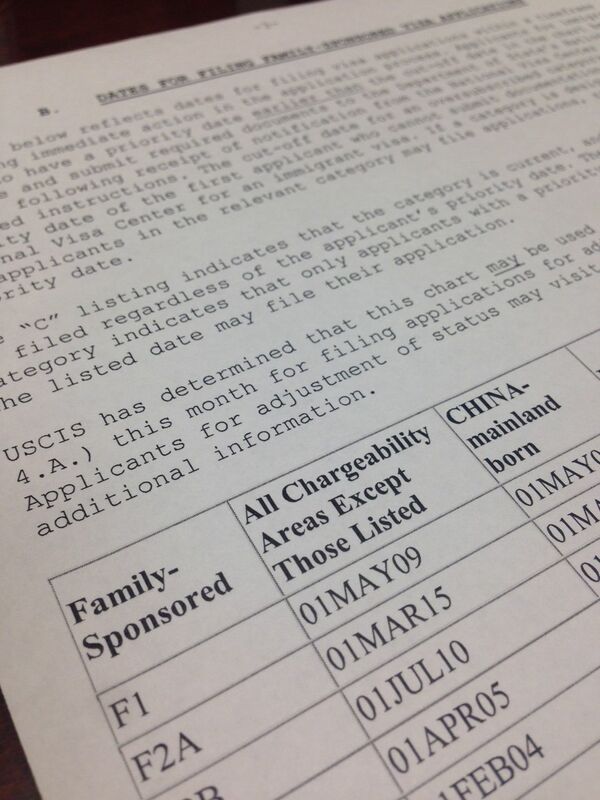 For example, if you are a Chinese Citizen and the Beneficiary of an Employment Based 3rd (EB-3) Preference Category Visa Petition and your Priority Date is April 3, 2013, you will have wait until the most current Visa Bulletin lists April 4, 2013 under the EB-3 Category for China before you are able to receive an Immigrant Visa or have your application for Adjustment of Status approved. As of October 2015, visas are available in the EB-3 category for China for applications with a Priority Date earlier than October 15, 2011. Or, if you are a Filipino citizen and the Beneficiary of a Family Based Fourth Preference Category (F-4) (brother or sister of a U.S. Citizen) and your priority date is November 1, 2003, you will have to wait until the most current Visa Bulletin lists November 2, 2003 as the Priority Date in the F-4 Preference Category for the Philippines before you are able to receive an Immigrant Visa or have your application for Adjustment of Status approved. As of October 2015, visas are available in the F-4 Preference Category for the Philippines for applications with a Priority Date earlier than May 1, 1992. Until this week, Beneficiaries had to wait until the Visa Bulletin listed their Priority Dates as current for issuance of a visa to file an application for an immigration visa or adjustment of status. However, beginning with the October 2015 Visa Bulletin, Beneficiaries in both the Family Based and Employment Based preference categories are eligible to submit applications for their immigrant visa or adjustment of status before the visa number is actually available. The Visa Bulletin now includes two charts of Priority Dates, one chart listing Priority Dates that are eligible for issuance of a visa (Eligible for Final Action) and one chart listing Priority Dates that are Eligible for Filing of a Visa Application (Eligible for Filing). For those unfamiliar with the visa backlogs, it may seem odd that a Beneficiary would want to submit an application for an immigrant visa or adjustment of status well in advance of the date when the visa could actually be issued. However, early filing has many benefits for Beneficiaries of immigrant visa petitions and their family members. A Beneficiary who is authorized for Filing under the New Visa Bulletin and who is either 1) currently maintaining lawful non-immigrant status in the United States or 2) the Beneficiary of a petition filed on his or her behalf prior to April 30, 2001 (thus forgiving unlawful entry and status under section 245(i) of the INA) can file an application for adjustment of status (Form I-485) with the USCIS. Critically, the spouse and unmarried child under 21 of the Beneficiary can also file applications for adjustment of status with USCIS. Individuals with pending Adjustment of Status applications are eligible to receive a temporary Employment Authorization Document (EAD) and Travel Permission. Thus, these Beneficiaries and their spouse and children may be eligible to receive Employment Authorization and Travel Permission while they wait the remaining months or years until their Priority Date becomes current and a visa number becomes available. It is important to remember that for a Beneficiary of a Preference Based Visa Petition to be eligible to file for Adjustment of Status, the Beneficiary must be either maintaining lawful nonimmigrant status at the time the application for Adjustment of Status is filed or the Beneficiary of an immigrant visa petition that was filed on his or her behalf prior to April 30, 2001. If the Beneficiary (or his or her spouse/children) are out of status (and are not the Beneficiary of a visa petition filed prior to April 30, 2001), they are not eligible for adjustment of status in the United States and will be required to process their immigrant visa abroad. For example, an Indian citizen who is the Beneficiary of an EB-2 Preference Petition with a Priority Date of June 30, 2011 is eligible to file an application for adjustment of status with USCIS under the new framework. This same individual is not likely to receive her lawful permanent residence for many years because the priority date for issuance of the visa is only May 3, 2005. The Beneficiary is in the United States on O-1. Her spouse is on O-3, a status that does not carry employment authorization. This Beneficiary, along with her spouse can each file applications for adjustment of status with the USCIS. They will each be issued EADs and Travel Documents (Advance Parole) within 90 days of filing. They will be able to renew their EADs and Travel Documents until the application for adjustment of status is adjudicated and they receive lawful permanent residence in the United States. A Beneficiary who is authorized for filing under the New Visa Bulletin and who is either outside of the United States or is in the United States without lawful immigration status (and is not protected under section 245(i) of the INA) can begin processing his or her Immigrant Visa Application (Form DS-260) with the Department of State’s National Visa Center (NVC). Unlike an application for adjustment of status, a pending Immigrant Visa Application does not carry the benefits of employment authorization in the United States or temporary travel permission. However, the early filing of an immigrant visa application does have some advantages. In particular, the Beneficiary’s unmarried children under age 21 may benefit. Under the current system, the backlog of visa numbers is so lengthy that the children of many Beneficiaries “age out” (reach the age of 21) before the visa become available to their parent, thus eliminating the possibility of receiving an immigrant visa as a derivative on their parent’s case. For children who are currently under age 21 but who are likely to “age out” before their parent’s Priority Date is current, filing an immigrant visa application as their parent’s derivative prior to reaching age 21 will protect these children’s eligibility to receive an immigrant visa in the future regardless of whether they reach the age of 21 prior to visa issuance. For example, a Mexican citizen who is the Beneficiary of an F-2A Preference Petition with a Priority Date of February 14, 2015 is now eligible to file an application for an immigrant with USCIS. This same individual is not likely to receive her lawful permanent residence for at least a year because the priority date for issuance of the visa is only March 1, 2014. The Beneficiary is in the United States without lawful status. Her 20 year old son is in the U.S. with Deferred Action for Childhood Arrivals (DACA). This Beneficiary and her son can file applications for their immigrant visa with the Department of State. Critically, the 20 year old son will preserve his eligibility for the visa as a dependent of his mother even after he turns 21. While the early filing of an application for adjustment of status or an immigrant visa has many benefits, it is also important to consider whether an application for adjustment of status could impact your ability to continue to maintain your non-immigrant status. For example, several non-immigrant categories such as F, E, and J require that an individual intend to remain in the United States for a temporary period of time. An application for adjustment of status may serve as a signal of an intention to permanently reside in the United States and could jeopardize the ability to renew or extend certain non-immigrant visas. For more information and guidance on the new visa bulletin and early filing opportunities, please contact Kolko & Associates, P.C.